As most Arizona drivers are well aware, you can’t believe everything you read on the Internet. That can be especially true about winter auto repair in Phoenix. Since much of Arizona doesn’t face severe winter weather, when they do they may need some expert advice. For those areas that experience snow and ice, the mechanic in your auto repair shop in Phoenix is a good choice for information. Here are a few winter auto repair myths debunked. There are things four wheel drive can help you with and there are things it cannot help you with. Four wheel drive provides more traction to help you drive through deeper snow, and hopefully keep you from getting stuck. What four wheel drive can’t do is help you stop. When it comes to stopping, a four wheel drive vehicle is no better than a two wheel drive vehicle. Even if you have four wheel drive, when the weather is slippery, maintain extra distance between you and the vehicle in front of you and allow extra time for stopping. This advice is outdated. Cars built over the last 20 years no longer have the same carburetors as older cars. They have been replaced with electronic fuel injectors that provide the ideal mixture of air and fuel, making them much more efficient. This eliminates the need for a lengthy warm up time. Twenty to thirty seconds warm up is plenty of time for the oil to properly lubricate the engine before you drive away. Allowing your car to idle for any longer than that simply wastes fuel. If you do much driving in the snow, your mechanic can tell you that you should use snow tires. Snow tires are more pliable and have deeper treads than all season tires. This provides a much better grip on slippery roads and also improves stopping time. Snow tires are a bit of an investment since during the summer months you should have your car repair shop in Phoenix replace them with all season tires and then change back again when winter returns. During warm weather these more pliable and deeply treaded snow tires produce more drag, which will reduce your gas mileage. An ideal solution would be to purchase snow tires along with wheels. That way as the seasons change, your car repair shop can easily swap out your set of all weather tires with snow tires and vice versa, rather than having to mount and balance each set of tires every time the season changes. If you don’t know the correct tire pressure for your vehicle you can check with your auto repair shop. It is unsafe to operate your vehicle with tires that are not inflated to the manufacturer’s specifications. Deflating your tires will only serve to compromise the integrity of your tire. As a matter of fact, during cold weather you may need to add air, since your tire pressure will naturally drop as the temperature drops. Warm air expands, cold air contracts. If you require better traction for driving in the snow, you should ask your mechanic in Phoenix to swap your all season tires for snow tires until the weather improves. Snow tires are specifically made to maintain their integrity in cold snowy weather while providing a better grip on the road and improved stopping time. You may also want to consider fitted snow chains if you live in a mountainous region. While it is true that winter can be hard on a car battery, summer can be even worse. During cold weather the engine may be harder to turn over, causing wear and tear on your battery, however, the truth of the matter is that more car batteries die in the summer. This is especially true in Arizona, due to the heat causing the water in the battery to boil dry. If you have ever experienced freezing rain creating a thick coating of ice on your windshield you know how difficult it can be to remove. Unfortunately, many people learn the hard way that trying to thaw it with hot water is likely to result in a cracked windshield. Glass cannot handle such a sudden and extreme change in temperature without breaking. If you have no sheltered parking place available, try a protective windshield cover that you can simply remove when it’s time to leave. If all else fails, you may need to allow your car to idle with the defroster running full blast until you can remove the ice. The expert mechanics at Scottsdale Muffler & Automotive will be happy to answer any winter driving questions you may have. Scottsdale Muffler & Automotive has over 20 years of experience in meeting Arizona’s car care needs. They are a family owned and operated business that treats their customers like friends. They provide all types of vehicle repair, from simple maintenance to complicated engine and transmission rebuilds. In addition, they are also experts at installing performance upgrades and customization. 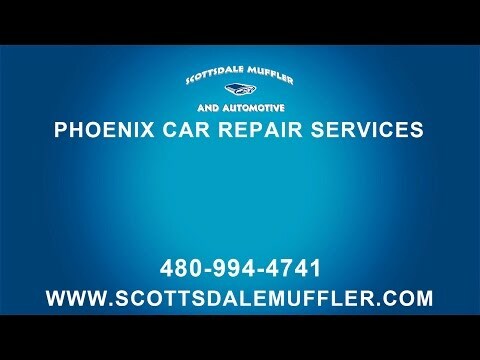 Come in and see why customers speak so highly of Scottsdale Muffler & Automotive.